These were one of my favorite discoveries on our trip to Paris this summer. Walking along the river one day, we saw all of these green boxes. We made a few guesses, but couldn't figure out what they were. . .
. . . until the next day, when we saw them opened up. They're used book stands! Businessmen on their way home from work, mothers doing the shopping for the day - everyone stopped to peruse the selection of books. And I would have been right there with them, if only the books weren't all in French. Instead, I had to settle for taking pictures and enjoying the aesthetic appeal. Why is it that visits to Barnes & Noble are so hit and miss? There comes a time, though, when I have found a book that I want to own, and I'm not willing to wait for it to hit the bargain bookshelves (I will wait for it to come out in paperback though - no $25 hardcovers for me). I enter Barnes & Noble, perfectly willing to pay full price for a new book. Such was the case last night. I had a list of two books I wanted to buy - Mr. Penumbra's 24-Hour Bookstore by Robin Sloan (my review here) and Escape from Mr. Lemoncello's Library by Chris Grabenstein (my review coming soon, but you can tell that I loved it by the fact that I was willing to buy it). To top it all off, it was my birthday, so the stakes of finding what I wanted and enjoying my visit were even higher. I perused the bargain bookshelves first (of course) and found two books I was semi-interested in, but I was soon headed purposefully to the books I had come to buy. Let's just get to the sad bottom line - neither of them were in stock. I looked alphabetically by author, glanced through the shelves of new fiction in case they were still there, and searched the free-standing tables of various topics. Nope. Nowhere to be found, confirmed by the store's computer. Now don't get me wrong. I love shopping for books. I will enter a bookstore anywhere and anytime, and it's extremely rare that I come out empty-handed. But it's not often that I'm willing to pay full price for a brand-new book. And when I am, I expect the bookstore to have what I'm looking for in stock. Were the books so popular they just flew off the shelves, or did they never have them in the store in the first place? That I don't know. I only know I rather sadly picked up my two bargain books, supplemented them with one my husband would enjoy (like every little boy who grew up to be an engineer, he still loves Legos and books about Legos), and headed to the check-out counter. I guess in the future, when I'm willing to pay full price, I won't get my hopes up too high. Has this happened to anyone else? Have you been disappointed in the offerings of your local bookstore? Or do you always walk out with an armful of books, no matter what? I’ve only recently discovered magic realism, but it’s quickly becoming one of my favorite genres. Now I just need to find more authors (other than Sarah Addison Allen) who write it. Please leave any and all suggestions in the comments! The Peach Keeper follows two women in the town of Walls of Water. Paxton lives the life of a rich, young socialite. As president of the town’s Women’s Society, her life is filled with details and plans and lists. She seems to have everything – except independence (she still lives with her parents), love (she is in love with her best friend Sebastian, whose sexual preference is ambiguous), and friendship (her fellow members of the Women’s Society are more of the back-stabbing variety). Willa has moved back to Walls of Water after her father died unexpectedly. She now owns an organic sporting goods store and has done her best to distance herself from her former life in the town. When Paxton decides to host the Women’s Society spring gala in the former family home (well, mansion) of Willa’s grandmother, all sorts of family secrets are unearthed – both good and bad. I definitely enjoyed this book, although perhaps not quite as much as some of Allen’s others. The realism part won out over the magic. There are hints of magic throughout, but it’s not very prevalent. There is, however, a brief cameo appearance by Claire Waverly from Allen’s Garden Spells. It’s always fun to see books overlap. Willa and Paxton are characters you come to care for deeply and cheer for loudly. They were each so lonely in their own way that I wished I could befriend them myself! Through uncovering a family tragedy, they finally find friendship in each other. If The Peach Keeper would have had a sprinkle more of magic, it would have been much closer to perfect. Even so, I devoured it eagerly and will continue to do so for every one of Sarah Addison Allen’s books. All right, I think it's time to dive in and join the Classics Club. I've been compiling my list for awhile now (you can see it here), and I somehow ended up with 51 books instead of 50. Oh, well. Just one more great book to read! I love reading classics, but I don't always have the motivation to pick one up instead of an easier fiction read. That's why I'm glad there is a whole club full of people to encourage me along! I'm also willing to add some classics to my list. Are there an amazing books out there that I'm missing? Any suggestions? I gradually loved this book. I had high expectations for it. After all, it involves music and dragons. What could be better than that? I didn’t expect everything else to play such a part. In Seraphina’s world, there is a fragile peace between humans and dragons, a peace that has lasted forty years because of the charisma of the current leaders of each kind. As the leader of the dragons comes to celebrate the forty-year anniversary of the treaty, tensions increase. And to top it all off, the heir to the throne was just murdered in a way that strongly suggests dragon involvement. Seraphina, the assistant to the court musician, is drawn into trying to keep the peace. She walks a very thin and occasionally dangerous line between the two sides. I loved the creative twist that Hartman includes: dragons have figured out how to take the form of a human. In that way, they interact with and study alongside humans. I found Hartman’s dragons to be realistic characters – uncomfortable with human emotions and entirely rational beings. My expectations for dragonkind were more than met. I do with there could have been more music, but it’s always hard to satisfy me on that account. Once I realized the focus of the story was the complications of Seraphina’s existence and not her music, I was perfectly content to settle in to enjoy this story to the very end. The characters and the events just kept growing on me until I thoroughly enjoyed them. I didn’t want this book to end. And I just may have gotten my wish, since it’s clearly set up for a sequel! Also, make sure you read the Cast of Characters list at the end. The book had its moments of humor, but this list had me laughing out loud continuously! This is exactly what I need after Bout of Books! I can't believe how far behind I've gotten in writing reviews for the books I've read. One of my goals for Bout of Books was to catch up with writing reviews. Even though I wrote 6 reviews last week, I still didn't accomplish that goal. Hopefully this review-a-thon will change that! Hopefully I can catch up this week and start school next week without a backlog of reviews to write! Sharpen the pencil and begin! 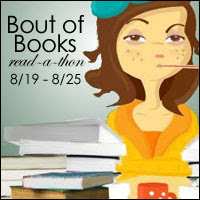 Bout of Books daily updates from my very first read-a-thon! Total time spent reading: 20 hours and 59 minutes (which is almost exactly an average of three hours a day!) - Goal met! Total number of books read: Six - Goal met! Total number of reviews written: Six out of eleven - Goal not so much met. . .
Two out of three goals met is pretty good! Here are the books I read. . . I would definitely call my first read-a-thon a success! Mostly because I had fun, even it I didn't meet all of my goals. I'm looking forward to the next one! So I've been looking for a way to show in more detail what I like about the books I read. Sometimes it doesn't come out very clearly in the review. Sometimes I spend more time focusing on what I didn't like, even though there are some definite positive things about the book. To solve this problem, I am now introducing the 5* Elements. For each book review I post on Smiling Shelves, I’ll include a list of those things that I absolutely loved about the book (well, only if it deserves them). For an absolutely amazing book, this will show what was so absolutely amazing about it. For a just plain good (or maybe not-so-good) book, this can show the redeeming features, things that were absolutely amazing even if the book as a whole is not. In other words, it doesn't have to be a five star book to have some 5* Elements. So how do the 5* Elements help you? Well, you know your own reading preferences. If you read books because of the characters, then look for my book reviews with a 5* Element of Character. If you love plot twists, look for that 5* Element. If, like me, you’ll pick up a book just because someone said they loved the character’s voice, then the ones with a 5* Element of Voice are for you! I’ll also be tagging my reviews with the various 5* Elements, so you can eventually click on the tag and have a whole list of books with that particular element. I’d love some feedback from you, especially as this system gets going. Does it work? Is it helpful? What are some other 5* Elements that you’d like to see? First book finished at: 11:33 a.m.
Major accomplishment of the day: Painting two bedrooms! How did I do all together? Check out my wrap-up post to find out!